I finally received and barely managed to get a picture of my prize apple. Remember I won it when Rebekah was having a giveaway? Well, it was devoured in a jiffy...every single chocolaty, caramel-y bite. Sweet! As halloween grew closer I tried to get the girls to commit to a costume idea. There was a lot of wishy-washiness going on and I wanted to make sure that I would have enough sewing/crafting time to create the costume of their choice. Their decision?...a ballerina and a princess. 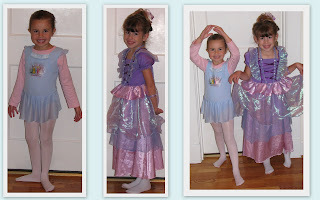 They plundered the dress-up box and were thrilled with their choices. My only duty was to get the hair to be just right! Sweet! Fall festivals and pumpkin patches are always fun. Pumpkins were painted, friends were played with, new slides were enjoyed, and the day was sunny and warm. Sweet! After a few weeks of thinking that the leaves would just turn brown and fall from the trees there are finally some beautiful colors to enjoy. I don't like the weather getting cooler...if you know me then you know I prefer the heat...but seeing everything so beautiful this time of year makes it all worth it. And besides, it was in the 70's yesterday! Sweet! I am making progress in my knitting. My brain doesn't hurt nearly as much now. The only thing that I don't like is that I'm a bit of a perfectionist and when I make a mistake I can't just pull out a few stitches to fix it...I have to pull out the whole thing. So far it's just been some practice swatches...no real projects. Crocheting, on the other hand, still comes easier to me and when I make a mistake in that, well, I just pull out the stitches to the mistake then keep on truckin'. Sweet! 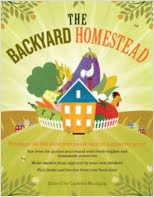 In all of my weirdness about farms and chickens and goats I have discovered the most wonderful of books...Backyard Homestead. It is a wealth of information and inspiration. A starting point, the beginning of real thoughts and plans and dreams. Sweet! That about sums up what we've been doing. I can't believe it's Friday again. The weeks are just flying by so fast. Thanksgiving will be here soon, and before we know it Christmas will arrive. I haven't made a dent in my list yet, but there's still time, right? Besides, we get to turn the clocks back tomorrow night and get an extra hour of sleep...sweet! Those girls are too cute. I hope the scarf is coming along ok. I know what you mean about ripping out knitting - it's a pain. I'm going to have to check out that book.